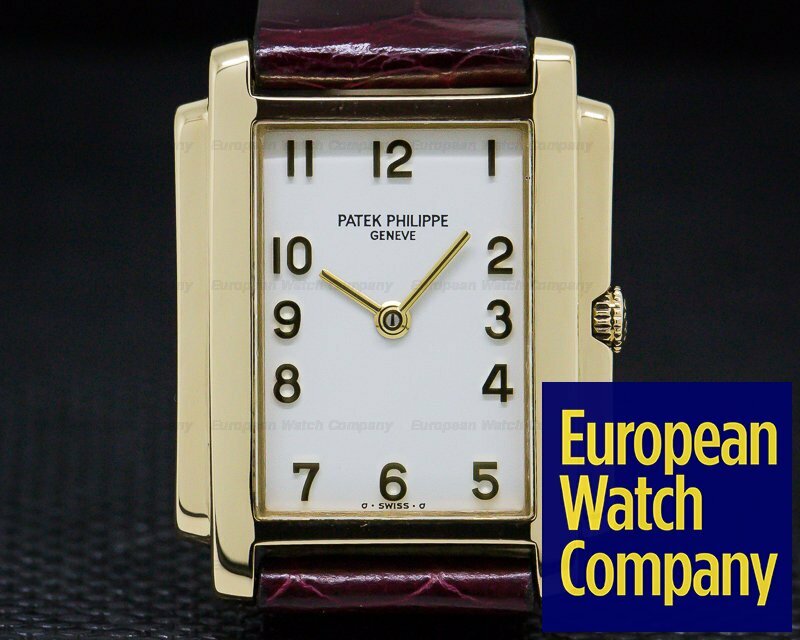 29632 Patek Philippe 4824 J Ladies Gondolo 4824J-011 4824J011, 18k yellow gold on a strap with a, 18k yellow gold tang buckle, Gondolo "tank" style case, Patek E15 quartz movement, white dial with applied yellow gold Arabic numerals and yellow gold baton hands, sapphire crystal, size 22mm x 28.5 (including lugs), thickness 5.3mm, Like New with European Watch Co. Box and Archive paper. 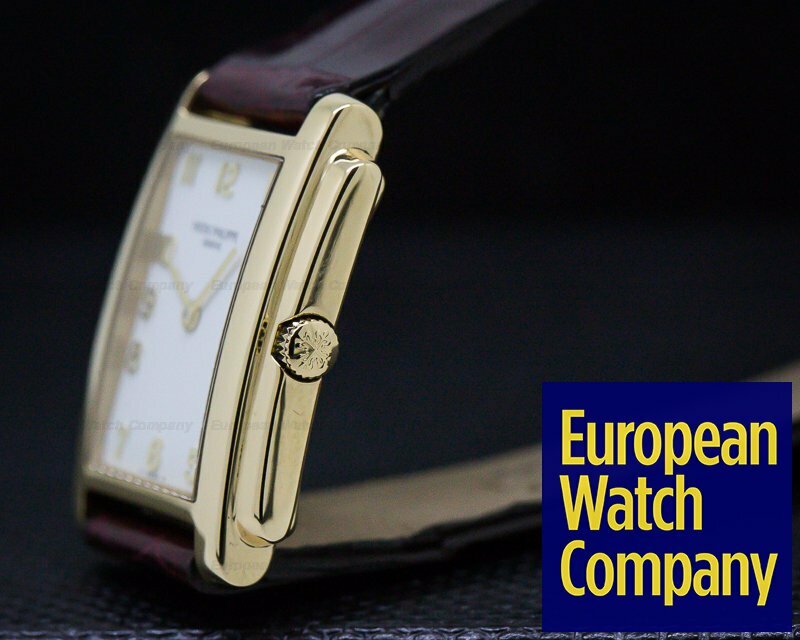 This is an 18k yellow gold Patek Philippe Ladies Gondolo 4824. 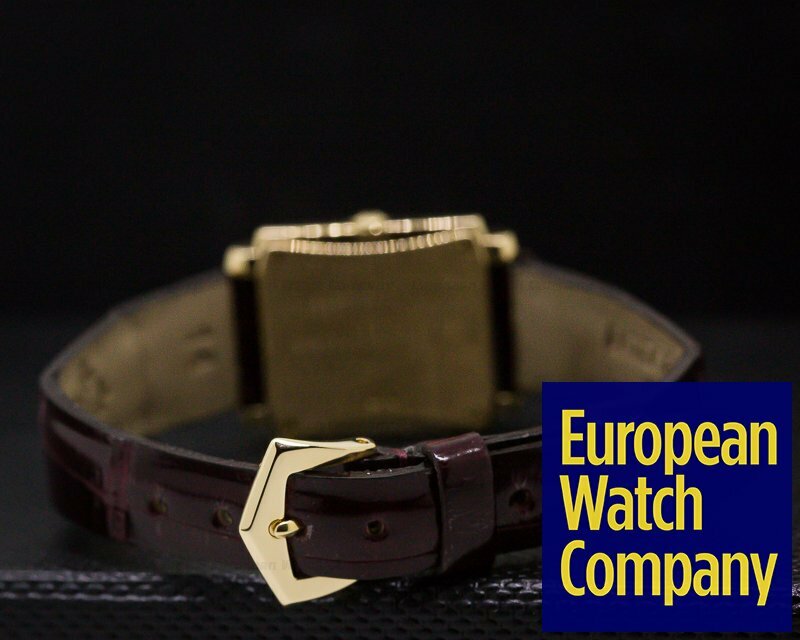 It has an alligator leather strap with a yellow gold tang buckle, and a scratch resistant sapphire crystal. It has a screw-down solid brushed case back secured with 4 screws, and a push/pull winding crown set into the case for a guard. The 22mm by 28.5mm art deco rectangular solid "tank" case, integral lugs, and stepped art deco bezel are polished. The dial is white with large gold Arabic numeral hour markers, with gold baton hands. 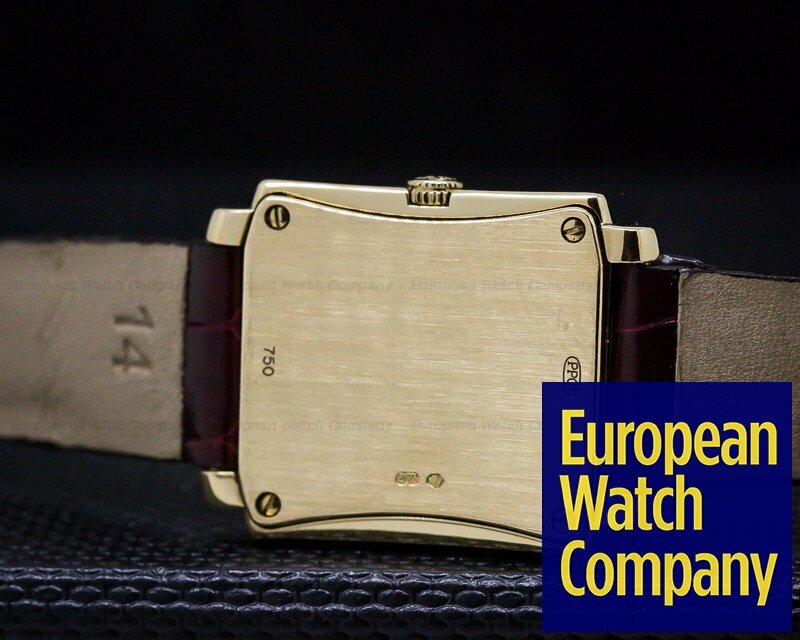 It's water resistant to 30 meters/100 feet, and the 5.3mm thick case, dial, and movement are all signed. 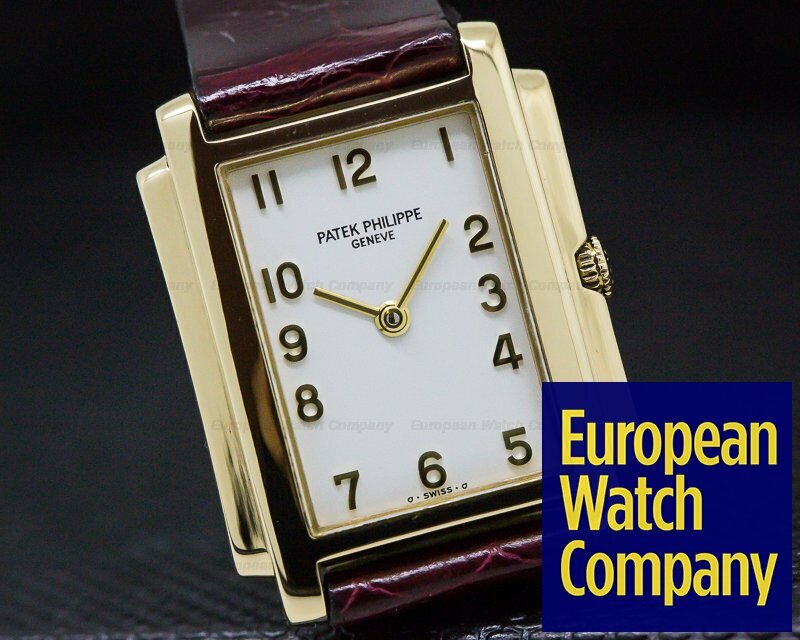 It has a Patek Philippe E 15 quartz movement, standardized for premier accuracy. It's rhodium plated, with fausses côtes embellishment and 6 jewels. 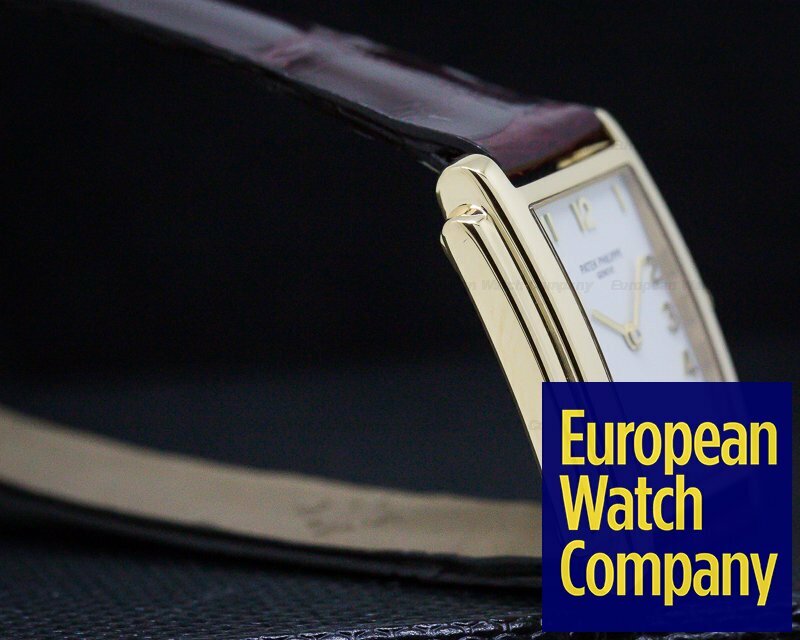 The Patek Philippe Ladies Gondolo 4824 was introduced in 2000.